NOTE: site information is a bit old. It is being rebuilt/renewed. A few new tools like for Ex. the LittleBone ice are missing. Please don't miss to visit us later for the updates. original fret leveling system made in Japan. Hand crafted with Passion and Quality materials. New site is almost ready! RECTIFY/Master levels frets instantly and naturally without removing the strings. RECTIFY/Master can be used by everybody with the same result. RECTIFY/Master allows you to achieve maximum accuracy rapidly and easily. RECTIFY/Master lets you check the instrument anytime while leveling. Every guitar player wants more fluidity. However sooner or later every player encounters an obstacle: irregular frets. Frets with grooves, worn frets due to use, a less than perfect assembly of the instrument and natural settling of the wood are all causes of this problem. These irregular frets require you to set up your guitar with a higher action to eliminate fret buzz. But the higher action forces you to press harder on the strings. In order to achieve more fluidity, you need a well-leveled fretboard which allows you to lower the strings and make a good set-up. Normally the strings are removed before the frets are leveled. But with Rectify Master, you can level the frets without removing the strings, and therefore work on the fretboard in its' ideal state. Rectify Master was designed to allow you to level your frets with the strings on in order to achieve the definitive shape. Even if you remove your strings for fret refinishing after leveling them with Rectify Master, when you put them back on and tune your guitar, the fretboard returns to that shape. 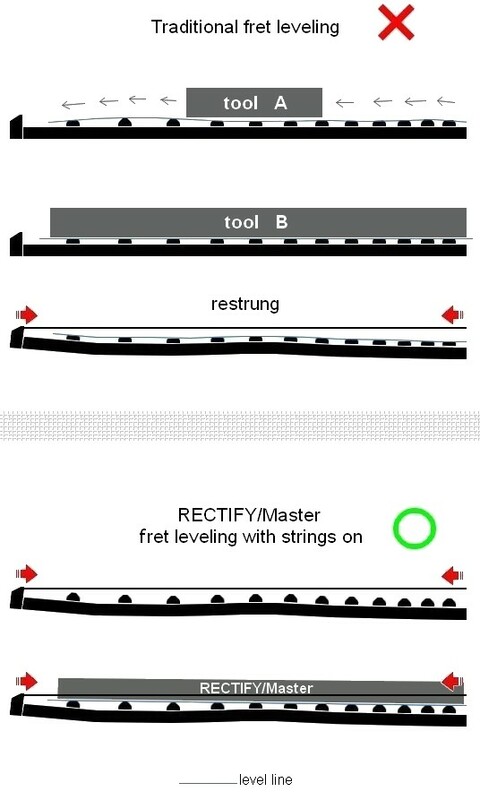 Rectify Master: For players and makers looking for a fret leveling system that will level your frets without removing the strings and give you a quick, affordable and most importantly perfect leveling.